The farmers market has been producing some exquisite berries this season. I’m not sure if they’re supposed to be in season or what, but they have been so unbelievably sweet, you’d swear that they dipped them in sugar. Crepes have been making themselves present lately in my world view as well. We’ve seen crepe cafe’s, crepe food trucks, and we finally had one filled with farm cheese at this little deli in Riverside named Relish. It was so awesome, I decided I had to try my hand at making them. I found Alton Brown’s Crepe Recipe on Food Network’s website, and made my own filling. For the crepes, I used Alton’s savory variation with Cointreau orange liqueur. If you don’t have wine or blackberry jelly, you can substitute 3/4 cup of water, and may want to sweeten it up just a tad with a tablespoon or two of sugar. Any jelly will work fine too, it will be just as tasty! Tart, sweet, and just in time to make for your sweetheart on Valentine’s Day morning! Place the wine, jelly, and blackberries in a saucepan, and heat over medium/medium-high heat until the berries begin to break down, about 10 minutes. As they’re breaking down, help them out and smash them with a wooden spoon. Once your berries are smashed to your liking, mix together the water and cornstarch until the cornstarch is mixed completely with the water. Turn the heat down to low, and add the cornstarch mixture to the berries. Continue to stir as the mixture thickens, then remove from heat. 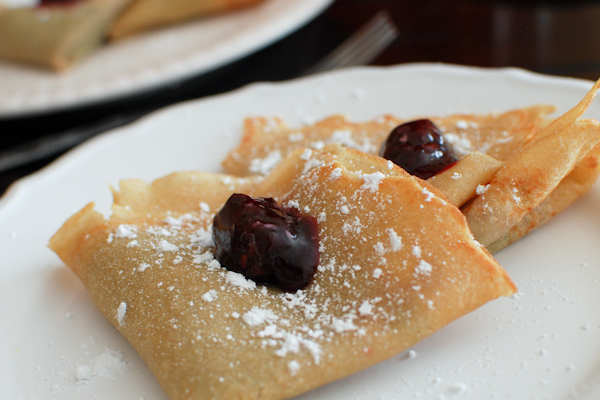 Spread a tablespoon of the mixture over the entire crepe, fold in half, then fold again until you’ve got a triangle. Top with a dollop of the mixture for presentation, and dust with powdered sugar. Previous Post: « Clementine MADNESS! I love me some Crepes!!! We got to hit the place in Ontario.